Better 9 Patch Tool is a software that is used to create nine patch images, and it can be used instead the draw9patch which is included in Android Developer Tools (ADT). With this tool, you can create a nine patched image more easily and more efficiently than before. You had to draw lines on each image with the original nine patch tool(draw9patch). But with Better 9 Patch Tool, you can handle similar images, according to the screen sizes(ldpi / mdpi / hdpi / xhdpi) or states (normal / focused / pressed / disabled …), at once. Because it uses proportions instead of pixels internally. Nine patch image is mostly used in designing and developing an Android application. Better 9 Patch Tool is designed to process multiple images at a time, so it's quite helpful to save precious times of the Android developers, designers, and themers. It's been developed using Java. It means that you can launch this tool whatever your OS is, Windows, OS X, and Linux. Set values with a mouse dragging or sliders. It provides enough space to draw comfortably. Mostly used values can be saved as a preset. A preset can be reused to another image. Larger margin area than the original tool makes you work more easily. Values can be reused because it uses proportion instead of pixel internally. Image is zoomed automatically to fit on the workspace. To open a file, just drag and drop it. When saving a file, there is no need to specify the file location and a file name. File save dialog is not needed anymore, patched file will be saved with a single click. In the preview window, you can specify the degree of stretching horizontal and vertical, respectively. You can use multiple preview window instances. It can be handle all image files in a specific folder with a single process. You will be notified when new version is published. Upgrade doesn't require an additional cost. You can forward a working image directly to the draw9patch. The 'draw9patch' is embedded inside. Click the Download button, and download a Java package file. File extension of a Java package is 'jar'. You can save the downloaded Jar file to an arbitrary location. Installation process is not required. This software can be executed on most desktop operating systems that are supported by Java runtime. To launch Better 9 Patch Tool package, the Java™ Runtime(JRE) should be installed on your system. You can visit http://www.java.com to check whether it is installed, and download the recent version of Java Runtime Environment. Especially on OSX, users should install Java 7 or higher to run this software. This software is tested on Windows™, OSX™, and Ubuntu™ OS with a Java version 7. On the first time of running Better 9 Patch Tool, you must agree to the End-user license agreement to use this software. The software without entering a license key will be executed as an evaluation state. Some features are limited in evaluation version, however there's no expiration, so you can try as long as you want then purchase. Native packages are provided only for a user's convenience. Please notice that I could not provide any help on a system-related problem with a native package. For Windows user, an Installer for Windows is available. So you can download this setup file instead of the Jar file, and launch this software after an installation process. Installer for Windows is an executable setup file with an extension of '.exe' and recent Java runtime is bundled inside. Also, a Disk Image for OS X is available. After opening the downloaded '.dmg' file, drag Better 9 Patch Tool to Application folder to install. However, in most cases, using a Jar package file is highly recommended. If you like Better 9 Patch Tool, please consider buying a license to use this software. Following features will be unlocked after the application is activated with a license key. You can draw lines with your mouse. You can use preview window more than one instance. You can use a Batch processor and a File organizer. Following features are limited on a deactivated application. You can not draw lines with your mouse after an evaluation period is over. You can use only one preview window. You cannot use the Preset feature. You cannot use the Batch processor and File organizer, etc. The license to use Better 9 Patch Tool costs $24.99. Once you have purchased, a lifetime free upgrade/update is guaranteed. The use of Better 9 Patch Tool requires a license for each user. Payment is processed automatically via PayPal. 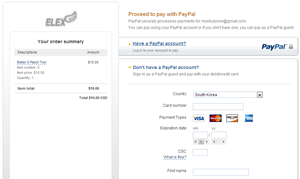 You can proceed the payment, even if you don't have a Paypal account, using your credit card. Click the 'Purchase' button on Better 9 Patch Tool's toolbar, or Click Buy Now button on the left, then a page where you can pay via Paypal will be displayed. Login PayPal or use a credit card to complete the payment. After the payment is confirmed, the license key will be sent to the e-mail address which you have entered. To activate the software, click the 'Activate' button on Better 9 Patch Tool and enter the e-mail address and the license key. Check your payment status by entering your email address. The license key will be e-mailed immediately, after the payment is done. However, if you didn't receive an e-mail after the payment, please let us know with some related information. Please feel free to join our Community on Google+. You can read more articles, and/or ask whatever you want to know. Also, You can request a help via e-mail.